Periodontal disease, more commonly known as gum disease, compromises the integrity of the hard and soft tissues supporting your teeth. In the presence of periodontal disease, the gum tissue protecting the teeth may recede leaving sensitive tooth structure and the uppermost portions of the roots exposed. While periodontal disease is responsible for most cases of gum recession, aggressive toothbrushing habits as well as the natural aging process can also be factors. Taking care of your oral health is important to your overall well being. In addition to affecting the appearance of your teeth by making them look unnaturally long and unattractive, gum recession can leave your teeth temperature sensitive and more vulnerable to decay both along the gumline and beneath it. The Pinhole Technique is a minimally invasive method of addressing gum recession. A scalpel–free and suture-free procedure, the Pinhole Technique offers a more comfortable patient experience than a traditional gum graft surgery. Performed with instruments specifically designed for this procedure, only a small pinhole in the patient’s gum tissue above the receded area is required to help expand and slide the existing tissue up to the gumline to cover the exposed roots. 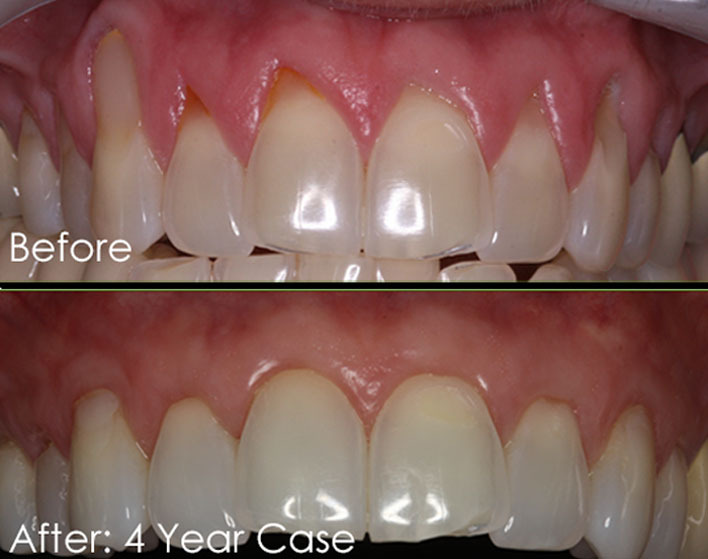 An effective method of care for treating gum recession, the Pinhole Technique offers pleasing and natural-looking results to rejuvenate your smile.